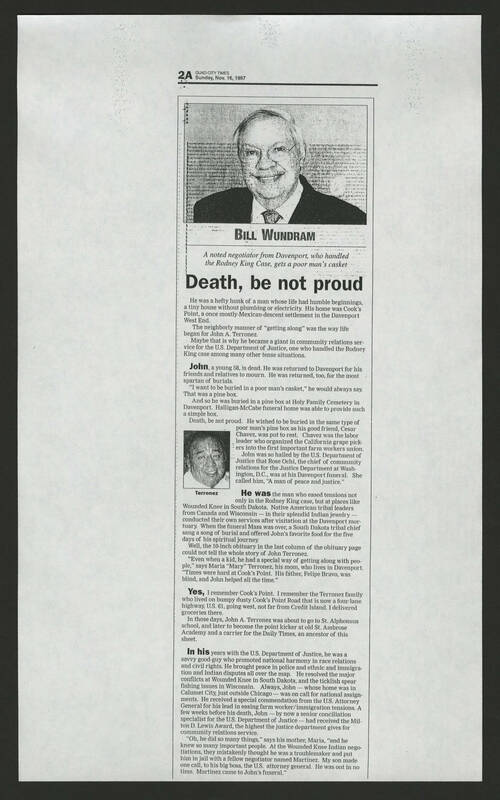 2A QUAD-CITY TIMES Sunday, Nov 16, 1997 BILL WUNDRAM A noted negotiator from Davenport, who handled the Rodney Kind Case, gets a poor man's casket Death, be not proud He as a hefty hunk of a man whose life had humble beginnings. a tiny house without plumbing or electricity. His home was Cook's Point, a once mostly-Mexican-descent settlement in the Davenport's West End. The neighborly manner of "getting along" was the way life began for John A. Terronez. Maybe that is why he became a giant in community relations service for the U.S Department of Justice, one who handled the Rodney Kind case among many other tense situations. John, a young 58, is dead. He was returned to Davenport for his friends and relatives to mourn. He was returned, too, for the most spartan of burials. "I want to buried in a poor man's casket," he would always say. That was a pine box. And so he was buried in a pine box at Holy Family Cemetery in Davenport. Halligan-McCabe funeral home was able to provide such a simple box. Death, be not proud. He wished to be buried in the same type of poor man's pine box as his good friend, Cesar Chavez was put to rest. Chavez was the labor leader who organized the California grape pickers into the first important farm workers union. John was so hailed by the U.S. Department of Justice that Rose Ochi, the chief of community relations for the Justice Department at Washington D.C., was at his Davenport funeral. She called him, " A man of peace and justice, " He was the man who eased tensions not only in the Rodney Kind case, but at places like Wounded Knee in South Dakota, Native American tribal leaders from Canada and Wisconsin - in their splendid Indian jewelry - conducted their own services after visitation at the Davenport mortuary. When the funeral Mass was over, a South Dakota tribal chief sang a song of burial and offered John's favorite food for the five days of his spiritual journey. Well, the 10-inch obituary in the last column of the obituary page could not tell the whole story of John Terronez. "Even when a kid, he had a special way of getting along with people," says Maria "Mary" Terronez, his mom, who lives in Davenport. "Times were hard at Cook's Point. His father Felipe Bravo, was blind, and John helped all the time." Yes, I remember Cook's Point. I remember the Terronez family who lived on bumpy dusty Cook's Point Road that is now a four lane highway, U.S. 61, going west, not far from Credit Island,I delivered groceries there. In those days, John A. Terronez was about to go to St Alphonsus school, and later to become the point kicker at old St. Ambrose Academy and a carrier for the Daily Times, an ancestor of this sheet. In his years with the U.S. Department of Justice, he was a savvy good guy who promoted national harmony in race relations and civil rights. He brought peace in police and ethnic and immigration and Indian disputes all over the map. He resolved the major conflicts at Wounded Knee in South Dakota, and the ticklish spear fishing issues in Wisconsin. Always John - whose home was in Calumet City, just outside Chicago - was on call for national assignments. He received a special commendation from the U.S Attorney General for his lead in easing farm worker/immigration tensions. A few weeks before his death, John - by now a senior conciliation specialist for the U.S. Department of Justice - had received the Milton D. Lewis Award, the highest the justice department gives for community relations service. "Oh, he did so many things," says his mother Maria, "and he knew so many important people. At the Wounded Knee Indian negotiations, they mistakenly thought he was a troublemaker and put him in jail with a fellow negotiator named Martinez. My son made one call to his big boss, the U.S. attorney general. he was out in no time. Martinez came to John's funeral."